The markets have ended the week down, marking the largest weekly decline so far this year. What a crazy week in the markets! 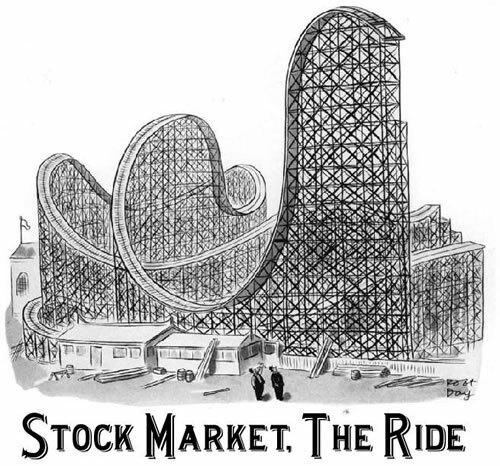 The markets have felt more like a roller coaster than the financial valuations of shares in companies, with prices swinging wildly on an almost daily basis and that’s in a week where there was virtually no significant economic and other driving news. Investor sentiment has really shown how quickly investors views have and can change from optimist to pessimist. This change was expected as we have seen a lack of market volatility and investment realism based on actual underlying fundamentals so the likelihood of the “king’s new clothes” scenario I had expected. The question is – is this just a bit of profit-taking before the rally continues or the end of an overzealous spike – the calm before the storm and panic? I am expecting a short-term pull back based on fundamentals, Eurozone fears, US & China economic story and reality that the markets have priced in an overly optimistic view of the near future. In spite of this I believe the general trend and data show a positive story over a long time horizon but the short-term will be volatile and is currently over-priced with a further drop expected. The recent market drop and increased volatility reflects, in my opinion, investor sentiment regarding the health of the UK and global economies, which saw some of the most impressive gains of the year going into earnings season and were then wiped out over the last two weeks. I can confirm that prior to the recent declines, I had already restructured client’s portfolios to be significantly more defensive and the outcome is during this negative period we have made a profit and are well placed to take advantage of the opportunities created by the situation. Client’s investment risk exposure is carefully controlled to reflect their personal risk profile as a maximum if potential profits warrant the exposure. When we have weeks like the ones that have just been, help to explain why investing for the long-term is the only way to play the markets today but with the bias to maximise potential risk adjusted profits and minimise any potential to losses. The plan is to structure and manage clients’ portfolios to reflect potential risk/return opportunities with a limitation on the exposure as defined by your individual risk profile. To be sure, I believe you should stay well-informed about the recent happenings and this is part of the reason for the existence of this blog. However, wild swings like this week’s often hurt investors’ psyche more than they help unless you receive suitable support, guidance and investment advice. The risk being that investors can be largely distracted from the most central aim of saving and when you receive quality advice market volatility, panic and confusion can lead to enhanced profits.